Whether you're making chili for the big game or pulled pork for the next potluck, you can't go wrong with a slow cooker. There's simply nothing more convenient than being able to throw everything together in the morning and have a meal ready and waiting for you when you get back from work. After countless hours of research and testing—they don't call them slow cookers for nothing—we came away with five of the best slow cookers out there. All are between six and six and a half quarts, but that's where the similarities end. You'll see everything from manual to touchscreen controls, optional heat probes and locking lids, and even some with settings like sauté and steam. We tested five of the most popular slow cookers on the market to find which is the very best. The Cuisinart 3-in-1 Multi-Cooker is every meat lover's dream come true. Why? Because it boasts a removable nonstick aluminum cooking pot that can be used right on the stovetop. That means you can sauté or brown your meat before slow cooking it to mouth-watering perfection. 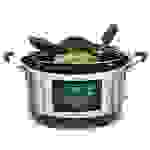 Not only does it offer a feature that isn't found on most other slow cookers, but the Cuisinart also produced consistently great results during our time cooking with it. For deliciously moist and tender pulled pork, the Cuisnart was the slow cooker to beat. It'll cost a pretty penny, but if you're looking for a feature-rich package that'll cut down on dirty dishes, the Cuisinart is perfectly poised to handle whatever you throw at it. The Hamilton Beach Set & Forget Slow Cooker strikes a balance between affordability and features that creates an impressive bang for your buck—even if you have to make a few compromises to get there. 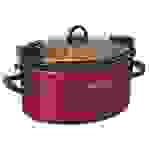 Most notably, this unit runs a little hotter than other slow cookers you may be familiar with, but luckily there's a handy accessory that can help take care of that problem. Bundled with the Hamilton Beach Set & Forget is a temperature probe that slips through a hole in the glass lid to take a reading from whatever you're cooking. If you've ever come home to a slow cooker that's turned off well before the roast is done, you'll be happy to know that you can program this beauty to switch over to the warm setting once your meat has reached the ideal internal temp. 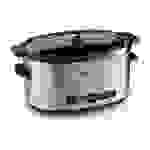 If you want to keep things simple and budget-friendly, the 7-Quart Manual Slow Cooker from Crock-Pot is about as basic as it gets. Despite its rock-bottom price, you might be surprised to hear it was one of our top performers across the board. You'll just have to be willing to keep a more watchful eye on your food (or extend the cooker a little more trust), since there's no programmable timer. Still, that's a small price to pay for a deal this good. It's not just the timer, though. This cooker is completely devoid of any special features. Not only will you have to set your own timer, but you'll also have to manually switch to the warm setting when your meal is done cooking. Just don't get too complacent when you do. While the low setting worked wonders on our pulled pork, our big pot of melted chocolate started to cool off and solidify when left on warm. Without the occasional stir (or dip with your favorite treat) you're left with a setting that's not quite warm enough. On the bright side, it has a locking lid, which means you can rest easy while traveling, knowing your food will make it to your plate instead of all over your car. 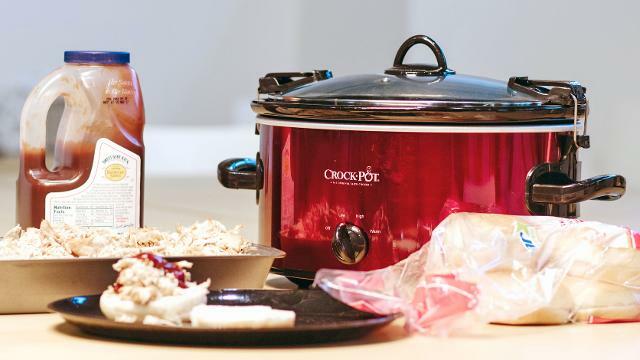 Taking a lone but potentially useful step into the digital age, this slow cooker from Crock-Pot features an easy-to-use touchscreen and a timer that goes from a mere 30 minutes to an unbelievable 20 hours. 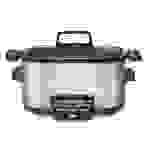 While most recipes won't take quite that long, this slow cooker will switch over to warming your food when the timer runs out. 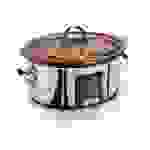 Of course, you'll have to pay a premium for those fancy controls, and this cooker also runs a bit hotter than the competition, scorching some foods and leaving our meat a little drier than its rivals did. But for ease of use and sleek looks that'll blend into any kitchen, the Programmable Touch Screen Slow Cooker from Crock-Pot is a solid buy. If you want simple controls but don't want to go full-manual, this KitchenAid is a great pick. It wowed us with incredibly easy-to-use settings and bright blue status LEDs that'll easily catch your eye across a busy kitchen. Featuring Low, Medium, High, and Warm settings, it's a bit more versatile than other slow cookers, giving you more options for perfecting a given recipe. While it hit most of our performance benchmarks, it didn't get our pork loin tender enough to tear apart in six hours—a feat all the other cookers in this roundup managed on their Low setting. Still, bumping the heat up to medium or leaving it in for a little longer should solve those problems.